Hitchhiker's Guide to the Galaxy Radio Show Live in Glasgow! The Hitchhiker's Guide to the Galaxy Radio Show - LIVE! The Hitchhiker’s Guide to the Galaxy became an instant and enduring classic on its launch as a radio series. Now Douglas Adams's immortal creation explodes back into life, re-born in a ground-breaking new touring stage production arriving in Glasgow this summer - a radio show like you never saw before - in surround sound, packed with laughter, robots, really wild sound effects and drinks with extremely silly names. 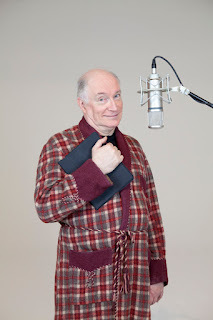 Members of the legendary Radio and TV casts are re-united for these live performances, led by Simon Jones as Arthur Dent, bringing to life the characters written for them in highlights from the entire Hitchhiker's Saga. They are joined on stage by a series of VIP Guest Voices of the Book and supporting actors from Hitchhikers in all its Phases, and the 'radio' part of the show isn't a gimmick - each event will be recorded and available to download afterwards, becoming a genuine audio experience the audience can enjoy over and over again. Directed by Dirk Maggs, Douglas Adams's choice to conclude the narrative in its original medium, The Hitchhiker's Guide to The Galaxy Radio Show - Live! is an adventure which will introduce newcomers of all ages to Vogons, Babel Fish, Marvin the Paranoid Android and allow them to explore the unique and hilarious Whole General Mish Mash According To Douglas Adams. Starring Simon Jones as Arthur Dent, Geoff McGivern as Ford Prefect, Susan Sheridan as Trillian, Mark Wing-Davey as Zaphod Beeblebrox and the voice of Stephen Moore as Marvin The Paranoid Android, The Hitchhiker's Guide to The Galaxy Radio Show – Live is at the Theatre Royal, Glasgow on 8th / 9th June.